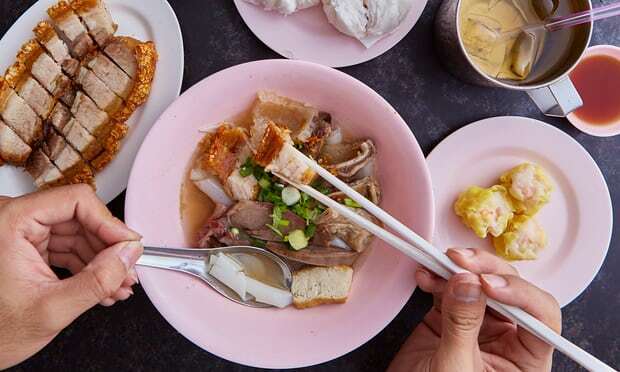 As published in December of 2017 of the first Michelin guide to the Thai capital, Bangkok’s culinary scene, never has a single Michelin destination offered so many choices for those on a budget. A two-star Le Normandie serves a business lunch for £35 and a lunch at one-star Savelberg costs 1600 baht (around £36, plus tax and service) – a surprising worth for a perfect meal. There is no need to spend even that much in a city known for its cheap eats, thus Bangkok opens a world of reasonable yet inexpensive possibilities. In the post below which I found on The Guardian, is listed some The 10+ Best Michelin-rated restaurants in Bangkok. The shop is called Kuay Jab Mr Joe for the rolled rice noodles in broth that are the signature dish of this shop-house. But really, everyone comes for the moo krob(crispy pork belly) that garnishes the soup. The crunch of the crackling is the perfect foil for the soft noodles in peppery broth, but it’s hard to resist an extra plate of delectable meat on the side. A sprinkle of vinegar and a pinch of fried chilli flakes are addictive condiments.